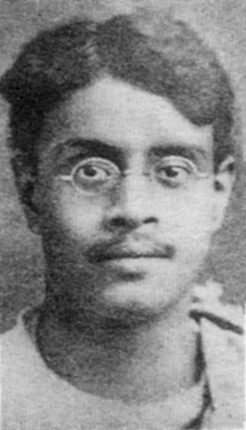 Sukumar Ray (1887-1923) was a Bengali humorous poet, story writer and playwright. As perhaps the most famous Indian practitioner of literary nonsense, he is often compared to Lewis Carroll. His works such as the collection of poems "Aboltabol" ("Gibberish"), novella "HaJaBaRaLa", short story collection "Pagla Dashu" ("Crazy Dashu") and play "Chalachittachanchari" are considered nonsense masterpieces equal in stature to Alice in Wonderland, and are regarded as some of the greatest treasures of Bangla literature. More than 80 years after his death, Ray remains one of the most popular of children's writers in both West Bengal and Bangladesh. Sukumar Ray was the son of famous children's story writer Upendrakishore Ray (Ray Chowdhury) and the father of legendary Indian filmmaker Satyajit Ray. Sukumar Ray was also known as the convenor of "Monday Club", a weekly gathering of likeminded people at the Ray residence, where the members were free to express their irreverent opinions about the world at large. A number of delightful poems were penned by Sukumar Ray in relation to the matters concerning Monday Club, primarily soliciting attendance, announcing important meetings etc. Ray was born in a Brahmo family in Calcutta, India on 30 October 1887. Born in the era which can be called the pinnacle of the Bengal Renaissance, he grew up in an environment that fostered his literary talents. His father was a talented writer of stories and popular science; painter and illustrator extraordinaire; musician and composer of songs; a pioneering technologist and hobbyist astronomer. Upendrakishore was also a close friend of Rabindranath Tagore, who directly influenced Sukumar. Among other family friends were Jagadish Chandra Bose and Prafulla Chandra Roy. Upendrakishore studied the technology of blockmaking, conducted experiments, and set up a business of making quality blocks. The firm M/s U. Ray & Sons, where Sukumar and his younger brother Subinay were involved. In 1906, Ray graduated with Hons. in Physics and Chemistry from the Presidency College, Kolkata. He was trained in photography and printing technology in England and was a pioneer of photography and lithography in India. While in England, he also delivered lectures about the songs of Rabindranath before he (Tagore) won the Nobel Prize. Meanwhile, Sukumar had also drawn acclaim as an illustrator. As a technologist, he also developed new methods of halftone blockmaking, and technical articles about this were published in journals in England. Upendrakishore started a publishing firm, which Sukumar and Subinay helped to run. While Sukumar went to England to learn printing technology, Upendrakishore purchased land, constructed a building, and set up a printing press with facilities for high-quality halftone colour blockmaking and printing. He also launched the children's magazine, "Sandesh". Very soon after Sukumar's return from England, Upendrakishore died, and Sukumar ran the printing and publishing businesses and the Sandesh (magazine) for about eight years. His younger brother Subinoy helped him, and many relatives pitched in writing for "Sandesh". Apart from the cultural and creative activities, Sukumar Ray was also a young man who was a leader of the reformist wing in the Brahmo Samaj. The Barahmo Samaj is the monotheistic unitarian branch of Hinduism launched by Raja Rammohan Roy following the philosophy of the monotheistic Hindu scripture Isha-Upanishad of 7th Century AD. Sukumar Ray wrote a long poem "Atiter Katha", which was a popular presentation of the history of the Brahmo Samaj -- it was published as a small booklet to introduce the rationale of the Brahmo Samaj to children. Sukumar also campaigned to bring in Rabindranath Tagore, the most famous Brahmo of his time, as a leader of the Samaj. Ray died in 1923 of severe infectious fever, "Kala azar", for which there was no cure at the time. He left behind his widow and their only child, Satyajit. Satyajit Ray would later become the most well known of Indian filmmakers and shoot a documentary on Sukumar Ray in 1987, 5 years before his own death. English Editions of Sukumar Ray, in chronological order. Each edition here has its distinct merits. Nonsense Rhymes. Translated by Satyajit Ray. Calcutta: Writer's Workshop, 1970.
" This volume by the author's son is the slimmest and is difficult to find. The Select Nonsense of Sukumar Ray. Translated by Sukanta Chaudhuri. New Delhi: OUP, 1987.
" The standard edition for many years. Abol Tabol: The Nonsense World of Sukumar Ray. Translated by Sampurna Chattarji. New Delhi: Puffin, 2004.
" This edition, the most complete, also has works from Khapchhada, Bohurupee, Other Stories, Haw-Jaw-Baw-Raw-Law, Khai-Khai, and Pagla Dashu. The Tenth Rasa: An Anthology of Indian Nonsense, edited by Michael Heyman, with Sumanyu Satpathy and Anushka Ravishankar. New Delhi: Penguin, 2007.
" This volume includes, amongst other Indian nonsense texts, quite a few Ray translations by Chattarji, including some that are not in her solo edition of Abol Tabol.